Mother’s Day is just around the corner and what better way to celebrate it than with high tea? A friend was visiting from Canada and we decided to take her out for high tea. We were a party of 3 ladies and one gentleman (me). Being the only dude, I definitely needed to check my man-card (yeh, I had one loaned to me after I manned up and ate the KFC Double Down) at the door. Not the door at Rotunda, but the door for Neiman Marcus. We each ordered a set for tea. I had the Earl Gray and Sam had the Pineapple Green Tea. Earl Gray is a winner for me no matter where I go. But, I’m a country bumpkin, I had no clue what to do with all the extra stuff they give you. A little bit of cream here, a spritz of lemon there, and plain. Plain was just good enough for me. Sam seemed to thoroughly enjoy her Pineapple Green Tea as she was quite reluctant to share. The first thing they serve you is the Chicken Consomme. To me, it tasted like Chicken Broth. A very rich Chicken broth that I wish I could make my ramen at home with. In addition to the tea set, we ordered the famous Popovers. They looked like poofy, fried dough balls that oozed down onto the plate. Eating them plain, wasn’t very good. 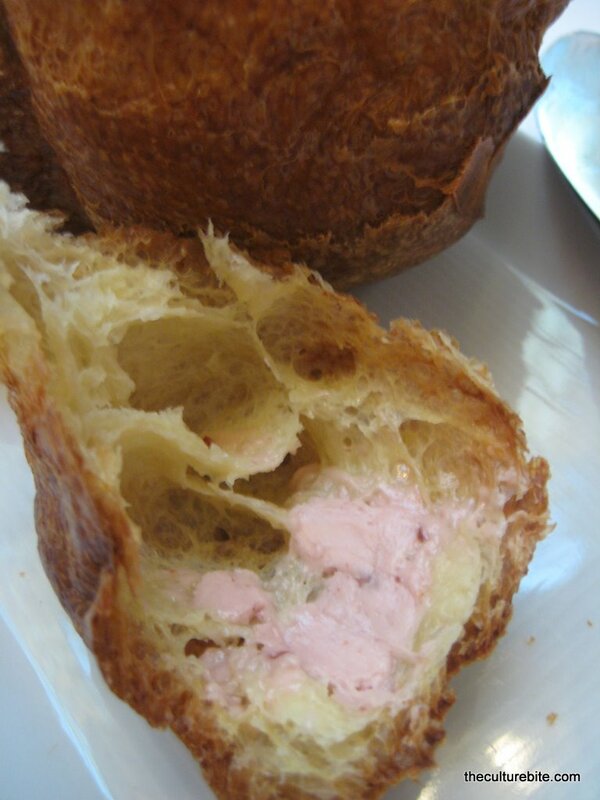 But, smearing on that Strawberry butter, made the popover delightful. I couldn’t help but giggle like a schoolgirl as I smeared more and more of that evil (but awesome) butter on pieces of the popover. The Scones that came with the tea set were pretty dry for me. I actually wonder if that’s how they are supposed to be. I mean, it would make sense if you break off some scone, smear some condiments (strawberry jam, lemon curd, clotted cream, and honey) and wash it all down with some Earl Gray. Now imagine my eyes, as I sit there and suddenly, there appears a tower of food. Tower! The tower had all kinds of goodness, but they were in these tiny girly portions. Egg Salad sandwich, Crab Salad Sandwich, cucumber sandwich and chicken salad were laid out on the bottom layer, while the top layer had mini chocolate cupcakes, carrot cake, chocolate espresso cake, fruit tartelets, and macaroons. You know, I want to say the girly portions weren’t enough, but I’d be lying. What I found was that I could barely try one of everything without being incredibly full. Good Job Rotunda, good job! The place is really elegant. You can feel the history off of the architecture. Which is one reason I felt out of place. Originally, I thought I would feel out of place as the only guy here, but it turns out, I was out of a place because I felt like a blue collar bowler while sitting there. I mean, I’m no slouch, but it felt like I should have worn more than a button up shirt and dark denim jeans. The service was mixed. The hostess seemed like she didn’t know what she was doing, and she dressed really sloppy for a place like this. Our waiter was good since he was courteous, friendly, sometimes talkative. Although, there were times were he would disappear for a long periods. When it’s all said and done, I would defintely do this again. It was fun. Next time, I’m holding onto my mancard on the way in, and wearing a tux. I love, Love, LOVE afternoon tea at the Rotunda too! In fact, you’re both probably too young to know but perhaps your mom or dad (S&JLee) mentioned that the glass dome is the original when City of Paris dept store used to be there. That was more than 40 yrs ago when I to used hit City of Paris w/my mom. Recently I had my mom’s 90th b-day luncheon at the Rotunda and their service and food were outstanding! You pay a pretty penny but it was worth every cent for the attentiveness they provided and the delicious lunch offerings. But whenever I take my mom on an outing in the downtown area, we always hit the Rotunda for afternoon tea. It’s too bad about the hostess though, service really makes a difference and especially for a service oriented business it can put a sour note on the visit. Wow, I never knew that about the glass dome. It is beautiful! How do you know my mom and dad?